The Cuisinart Processoris a mini-prep® plus metallic red which suits good for small food preparation from chopping herbs or bread crumbs, to finely grinding hard cheese. 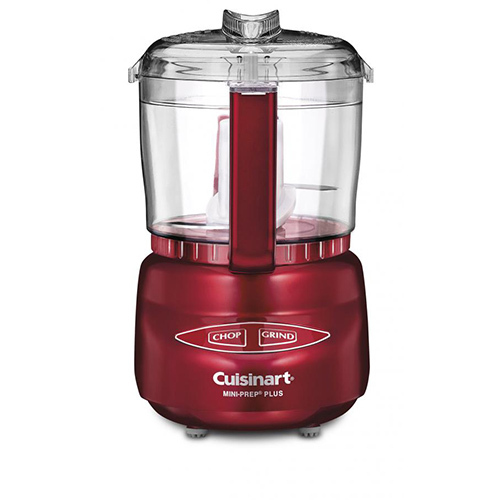 It features exclusive auto-reversing smartpower® blade for two powerful processing options, which makes it easier to process both soft and hard foods. The DLC-2AMR comes in a space-saving size yet more powerfull than other choppers. The touchpad controls are easy to use and easy to clean. The Mini-Prep Plus Processor Metallic Red has many exciting features for users of all types. You can extend the lifetime of your Mini-Prep Plus Processor Metallic Red with the purchase of a FactoryOutletStore Factory Protection Plan. See the Mini-Prep Plus Processor Metallic Red gallery images above for more product views. The Mini-Prep Plus Processor Metallic Red is sold as a Brand New Unopened Item.